Hello guys! Today, I’ve shared the review of Go Security app. GO is one of the few free security apps with 5+ million users and an excellent rating of 4.6. I discovered this application today while exploring the Play Store. While going through the app’s description, I learned that GOMO, the developer of the GO application has introduced the 2018 edition of its GO Security app. The new version of GOMO’s app has 3 new features. It consumes 51 megabytes storage memory and has advertisements. The app requires permission to read phone contacts, detect your location, access storage memory, and open the phone camera. First-time users of this app will see a window that features a checkbox and button. Users can enroll themselves in the UX improvement program by selecting the checkbox. To open the main interface, users must tap the start button. The UI of the app is clean and easy to use. It features a menu bar that allows you to open the settings interface and upgrade to the Pro version of the app. GO Security app supports two scanning modes – quick and deep. During the quick scan operation, the app scans APK files. If you chose the deep scan option, the application will scan all directories and files in the file system. Go Security allows users to add APKs to the ignore list. The Quick scan task can last for 5 to 10 seconds. As it checks the entire file system, the deep scan operation can last for 20 seconds to a few minutes. Clipboard cleaner: As in Windows OS, the Android operating system saves the text you copy from files and web pages to the clipboard. Keeping the bank login credentials, passwords on the Clipboard is not a good idea. To clear the Clipboard, you can either restart the phone or use the Go Security application’s Clipboard Cleaner utility. Real-time protection: When you turn on the real-time protection feature of GO Security, the application will block the installation of virus and malware infected apps. Users who browse the internet or download apps from websites other than Google Play Store must enable this feature. Safe Browser: The built-in browser of the GO Security app deletes browsing history automatically. It provides an option to hide the bookmarked URLs. It also checks website’s code executing it. The GO Security app’s inbuilt browser allows you to set DuckDuckGo, Bing, Baidu, Yandex, Google or Bing as the default search engine. Phone Alarm: If you have placed the phone on a table and someone picks it up, the Go Security app will play an alert sound. The app will also display a notification. Go Security can prevent the intruder from turning off the alert tone. To activate this feature, you must set a password for the Phone Alarm. 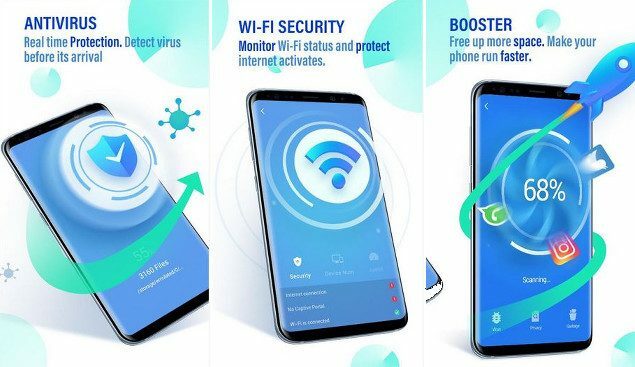 WiFi Security: The WiFi security utility of the GO Security app checks whether your phone is connected to a secure connection or not. The utility displays the network connection speed and number of devices connected to the hotspot/router. Battery saver: The GO app can find applications that are draining the phone’s battery fast. It can also free the RAM and processor used by the idle applications. CPU Cooler: If your phone is hot, you can use this feature of the GO Security application to cool it down. Junk file remover: The app can find and remove unwanted APK, log, and residual files from the smartphone. Memory Booster: If some applications on your phone are not responding, run the memory booster utility of the GO Security app. GO Security allows users to turn off automatic app updates, alert messages, real-time protection module from its settings panel. The app can display warning messages when the phone is running low on memory. You can prevent other users from uninstalling GO Security app by turning on the Advanced Protection feature. You can also schedule scans with this free application. Long press on the app’s icon. Now, you’ll see two options on the screen – Remove and Uninstall. Drag the icon on the Uninstall option. GO Security is a lightweight antivirus, app lock, and phone performance booster application. It has beautiful UI and features that work like a charm.